Hello, I want to delete all .php extensions in the url (except index.php). 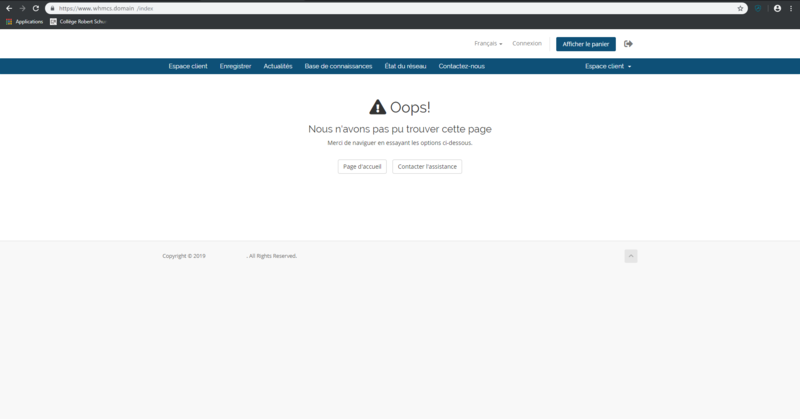 But this happens when I try to go on "Espace Client"
Tested within my dev admin without issue, however, the first one that removes the .php via a redirect will cause pretty much every page load within WHMCS to do a redirect to the version without .php and that can slow down page loads. @WHMCS ChrisD Can you help me please? For some reason, maybe security related, WHMCS requires .php on the file name for at least login.php where other ones worked . As it may require the same for other files, I would not recommend to remove the .php as it can cause unexpected issues. it's probably Friendly URLs related more than security, and i'd go along with the idea that it probably isn't worth attempting to do this.